Last night was the opening for the North Redwoods Book Arts Guild exhibition at Eureka Books. This has become an annual event over the last few years, and this was the best yet. It’s great that we have such an enthusiastic and supportive local spot for book arts here in our little corner of the world. Most of the books will be up for the month, including my pharmaceutical piece and the cat book noted below in recent earlier posts. If you’re local, come see it while you can. Members from as far away as Thailand submitted books. The books have also been posted on Flickr. 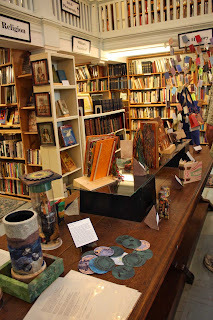 One of the problems, though, of having a show at one of my favorite bookstores is that I, not being so big into large social gatherings, had to keep fighting the urge to duck upstairs to hide among the shelves. 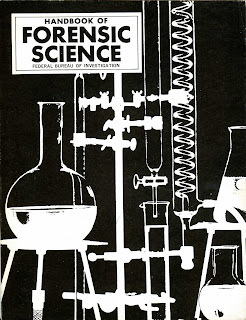 At one point, temptation was too great and I discovered a marvelous FBI manual from the 70s on forensic investigation. I owe my friend Shirl, who likes to alter things with a deliciously irreverent eye, a present. I hope she’s not reading this. Words to live by. Especially for those of us prone to digressing.